This page is dedicated to all the bits and pieces we couldn't think of where else to put. 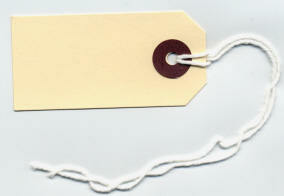 Strung Tag labels Labels, plain or printed. Polypropylene twine is a very widely used. With six alternatives to choose from on the shelf, there should be one to suit. 700m x 2.25kg, 450m x 2.25kg and 4.50kg, 350m x 2.25kg and 4.50kg, and 280m x 4.50kg. Polished Rayon twine, used mainly in the butchery industry, has, due to its incredible strength found uses outside of its traditional market. Available only to order (5 day delivery) and sold in boxes of 60 spools x 450gms. Sizes sold:- 104's, 5's, and 4's. Sold in outers containing 40 packs of approximately 1lb. We do on occasion have split outers, please ask. Larger sizes are available but not listed below. 180gm² manilla card with paper reinforced eyelet and 254mm long cotton string. We can supply self adhesive labels to almost any size, colour or shape. Printing to your own custom design and or lamination is at extra cost and is subject to a minimum quantity. As with the printed tape we are able to help with the design of your labels and provide you with a full colour proof should you require. Used in conjunction with a Stanley twist tool (also supplied) sack ties can be a very effective method of closure. Two sizes from stock 9" and 10" non coated. Sold in sacks of 5000. Carton staples as well as plier stapler staples are stocked. Carton staples in 32/15 and 32/18 as well as the 7437. We can supply to order most other staples as well as staplers of all types. Laurel clips are small plastic clips used for the closure of Jiffy and other padded postal bags. The ubiquitous cable tie has earned its place amongst the most indispensable of items along with gaffer tape and Swiss Army knives. Used for pretty much everything but sold here primarily for closing bags and sacks, but don't let that stop your imagination as to what they are good for.